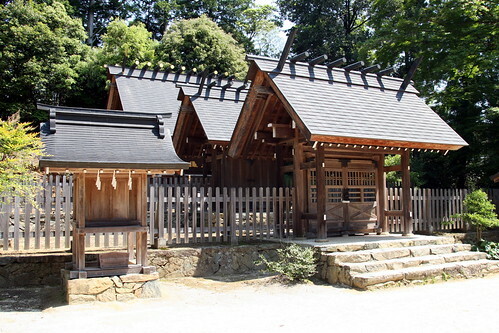 Authenticopy of Ise Shrine, a photo by timtak on Flickr. The above photo shows a copy of the most important shrine in Japan, that of Ise to the Sun-Goddess or her mirror, recreated 500 years ago in Yamaguchi City. People worship at this shrine as if worshipping at Ise. People worshipping here will not feel that this is just a copy but that it is authentic: an authenticopy. The sacred mirror enshrined at Ise was used to trick the Sun-Goddess out of a cave, with the words, "See there is someone as beautiful as you outside" and was latter passed, by the Sun Goddess to emperor of Japan with the words "See this as if it were my soul and worship it as if it were me." Description of the Sun Goddess as a mirror in Shinto Mythology may have preceded these two occurrences - The Sun Goddess was always a mirror. The mirror of the sun-goddess is believed by some to be in, or to be the heart of every Japanese (Kurozumi, 2000). In more literal terms, it is found that even today, the Japanese are able to simulate the presence of a mirror in their minds (Heine, Takemoto, Moskalenko, Lasaleta, & Henrich, 2008). Some people believe that words mean ideas and that these ideas are somehow both in the mind and in the world (or the mind of god). They believe furthermore that the meanings of words are not copies, but always authentic or (co)present (Derrida, 1011) with the authentic in each and every instantiation. The Japanese may believe that the world they see is both in the mind and in the world, or in the mind of a different type of seeing God. In that case perhaps "copies", such as copied horses or copied shrines, are not copies at all but authenticopies, and like Simulacra (Baudrillard, 1995) as close as one gets to the real thing. The real thing after all is a river (Heraclitus), so if there is anything it has to be a simulacra or authenticopy. Baudrillard did not differentiate between imaginary and symbolic copies but referred to both. However when he talks about the "mind of God" as that which insures the authenticity of these copies, presumably he is talking about his culture's logocentric God. In any event, I am using Authenticopy to refer to a subset of Simulacra, an authentic copy in the omnipresent (at least in Japan) mirror of the other. Heine, S. J., Takemoto, T., Moskalenko, S., Lasaleta, J., & Henrich, J. (2008). Mirrors in the head: Cultural variation in objective self-awareness. Personality and Social Psychology Bulletin, 34(7), 879–887. Heraclitus (n.d) "Everything changes and nothing remains still... and... you cannot step twice into the same stream"